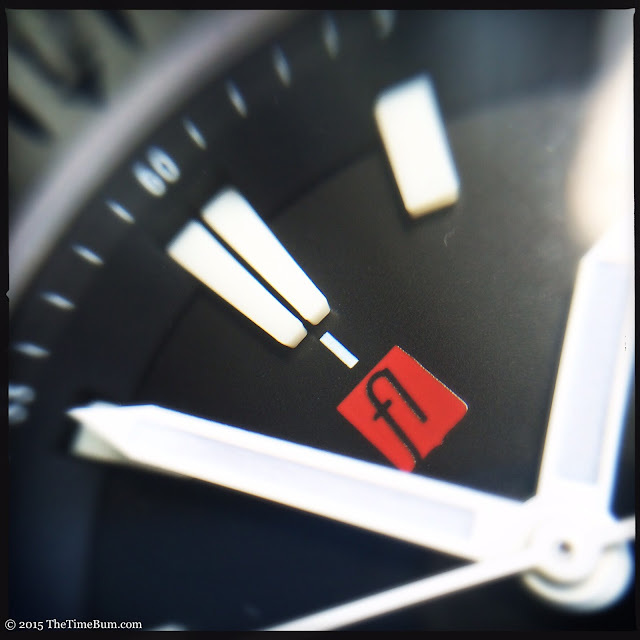 Hans Heuvelman founded Florijn Horologes to reflect Dutch character with a clean, simple, and powerful design. 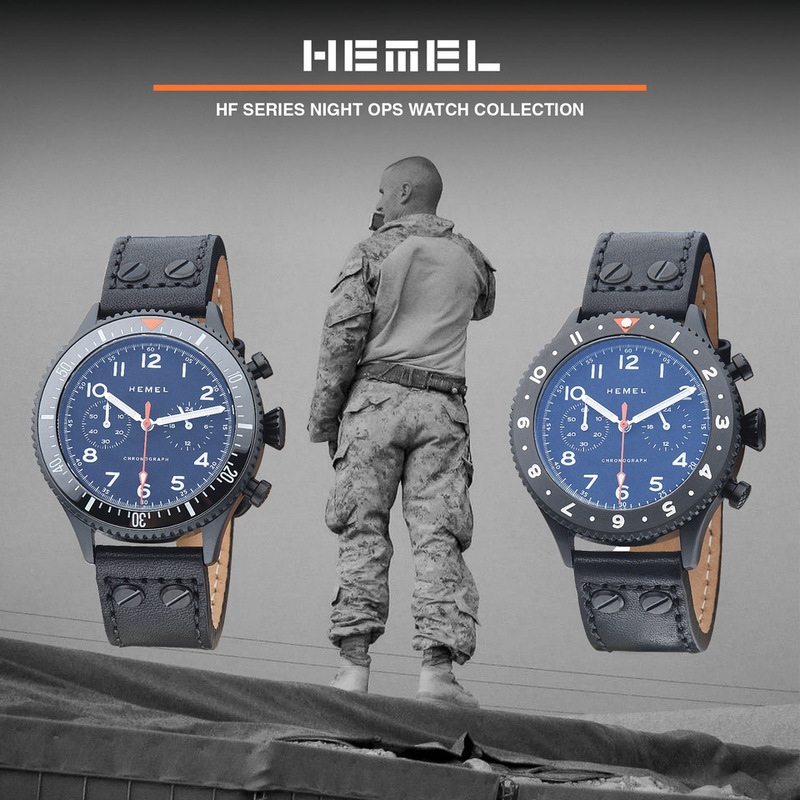 The debut models Een/One (brushed), Twee/Two (brushed with DLC black bezel), and Drei/Three (all black), are 300 meter divers in chiseled, vault-like cases. 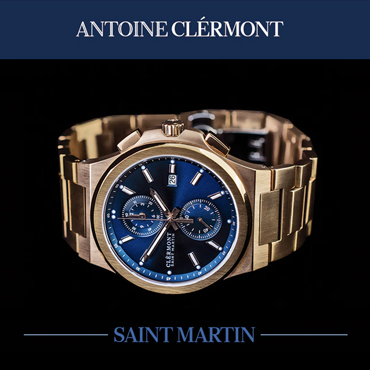 The watches use a Seiko automatic movement and sell for less than € 400. For this review, they provided a model One with a brushed case and bezel surface. It is not a subtle timepiece, and in this case, that is a good thing. Subtlety has its place. Dress watches should be subtle. So should your choice of colors for that interview suit. The day you tell your kid that the goldfish isn't actually "sleeping" upside down? Yes, that calls for a certain degree of subtlety. Then there are aspects of modern life where subtlety has no place whatsoever, like Harley-Davidsons, yelling "timber!" when you fell a tree, and the Florijn dive watch. 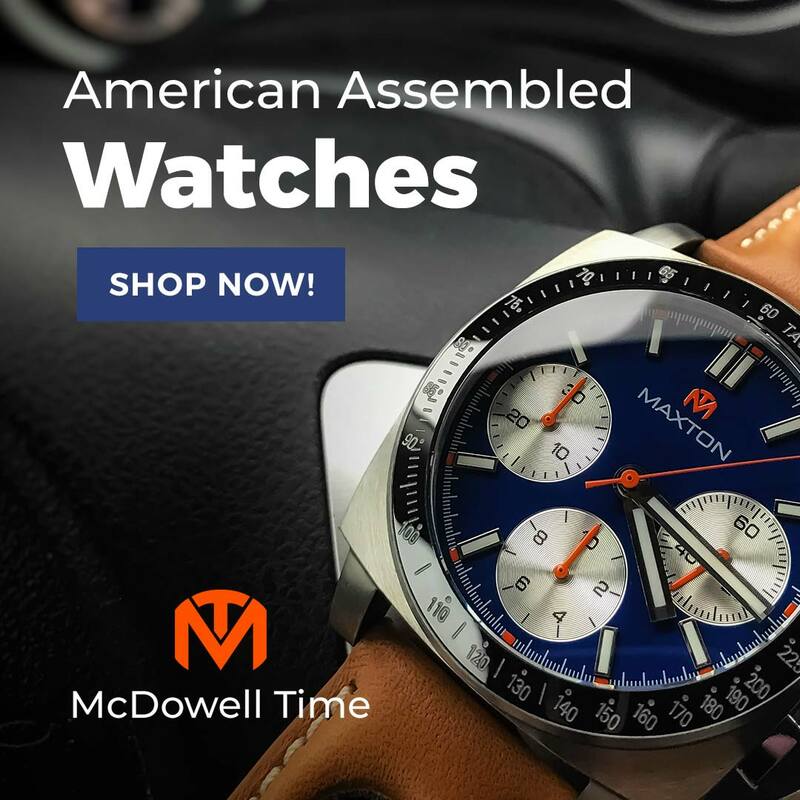 Regular readers know my affinity for small to mid-size watches, particularly for daily wear, but The Bum's collection also contains more than a few plus-size pieces for those weekend adventures, and the Florijn fits this niche perfectly. 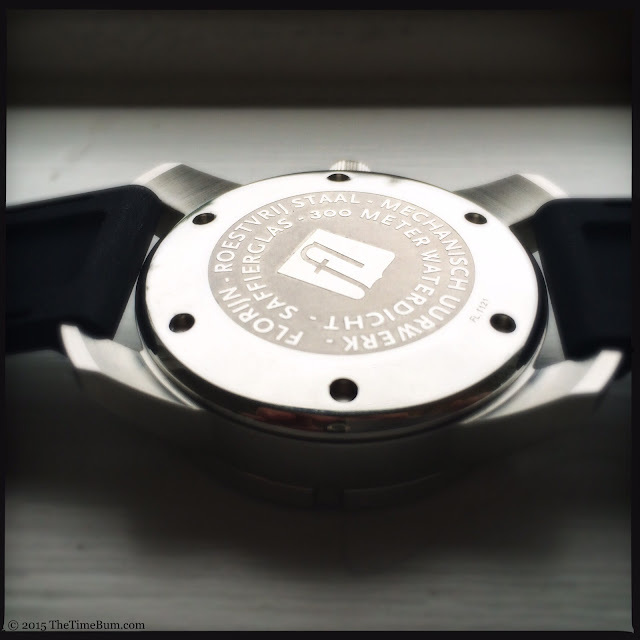 The broad stainless steel case is 45mm wide, 53mm long, and over 14mm thick. 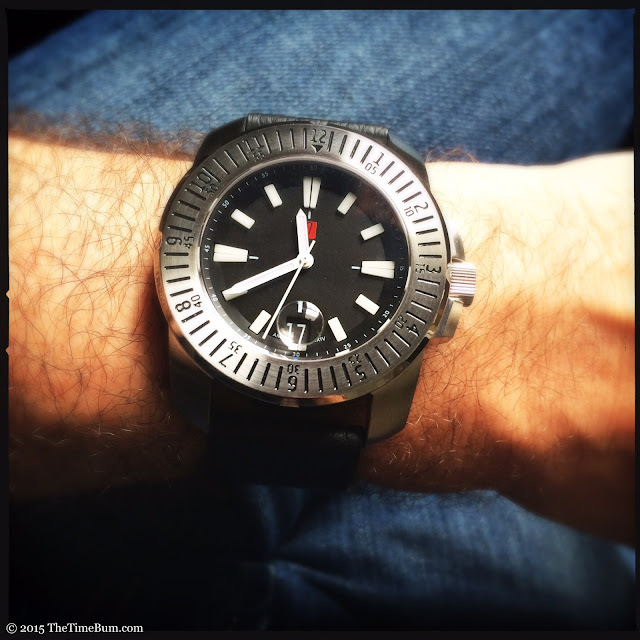 It is slab-sided, angular and it occupied every possible millimeter of space on my 6.5" wrist. Long, thick lugs dominate the shape. They are curved, but not tapered and look more like bridge abutments than strap attachments. Their broad shoulders straighten the sides and square the overall appearance. Blocky, beveled crown guards flank a stout, coin-edged, screw down crown signed with the "Fl" logo that also graces the screw-in case back. The bezel is a solid unit and has a truly unusual index, marked for every minute with numerals for both minutes and hours. It is a striking approach, detailed, yet highly legible and attractive. I think it comes through particularly well on the brushed finish. Strangely, it lacks a lume pip at top center, which looks great in daylight, but certainly limits its utility in low light. The grip is also different, eschewing coin edging and gear teeth for widely spaced notches. Given the bezel's busy layout, it was the right call. The sparse notches do the job without fighting the index. The flat surface is brushed with a black painted index, but it polished on the sides and beveled edge. The high shine coordinates with the polished crown, providing a nice bit of brightwork to contrast the otherwise flat finish. The action is firm through its 120 clicks and has no back play. 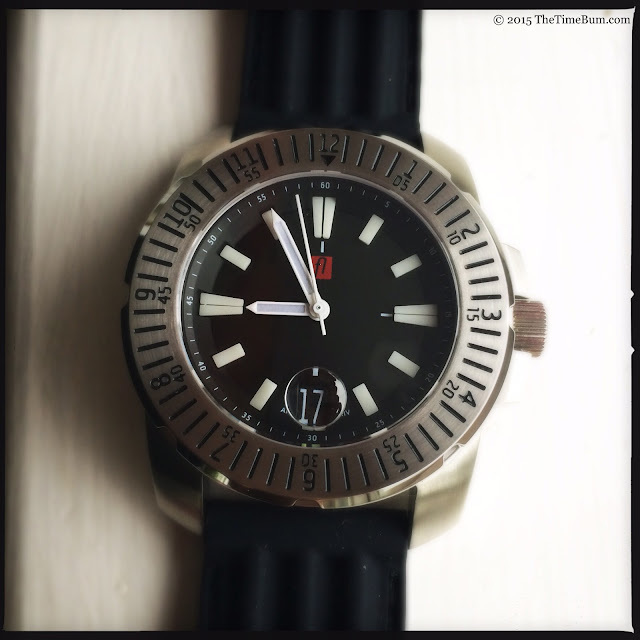 As arresting as the case may be, it is the dial that really makes the watch for me. The hour markers are tall white blocks on the black surface. Their height reminds me of the markers on the Seiko Prospex SUN019. The markers are treated with luminous material, as are the military looking white baton hands. The angled chapter ring is cut out around the markers, further enhancing the dimension of the dial. A red Florijn logo adds a spot of color. I like the fact that the markers are luminous on all sides, not just the top surface, but I would rate its quality as merely acceptable as the green glow fades rapidly. The most uncommon, and likely most divisive element is the magnifier over the 6 o'clock date window. Frankly, I didn't think I would like it. I am not a fan of date magnifiers. They are large, they distort, and they do precious little to help you view the date because, in order to take advantage of its magnification, you must view the dial head-on. Glance at the watch even slightly off angle and the date is lost entirely. And yet, I warmed up to it after wearing the watch for a few days. It may not be the most practical item, but that bubble is a distinctive touch that amplifies its character. Inside this tank is a 24 jewel Seiko NH35 automatic. It is a reputable unit that hacks, hand winds, beats at 21.6k bph, and should provide years of trouble free service. 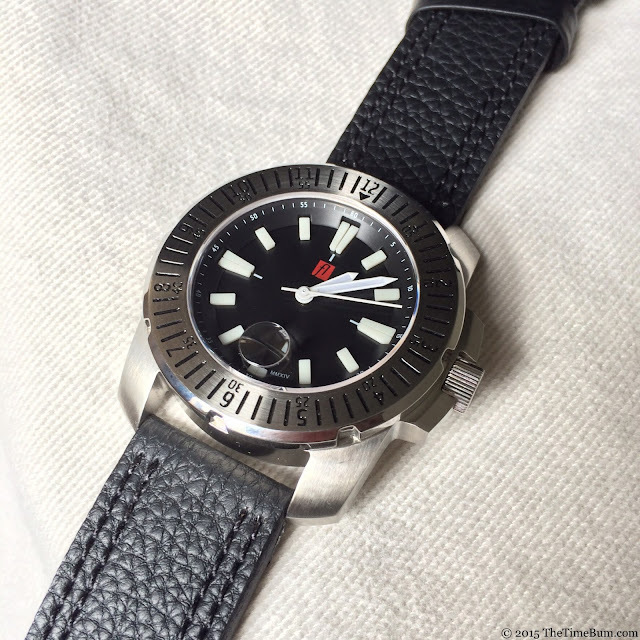 A high chunk of steel like the Florijn needs a solid attachment to your wrist and each watch gives you three 24mm straps from which to choose. The first is ribbed black rubber with faux stitching and a thumbnail buckle signed with the logo. 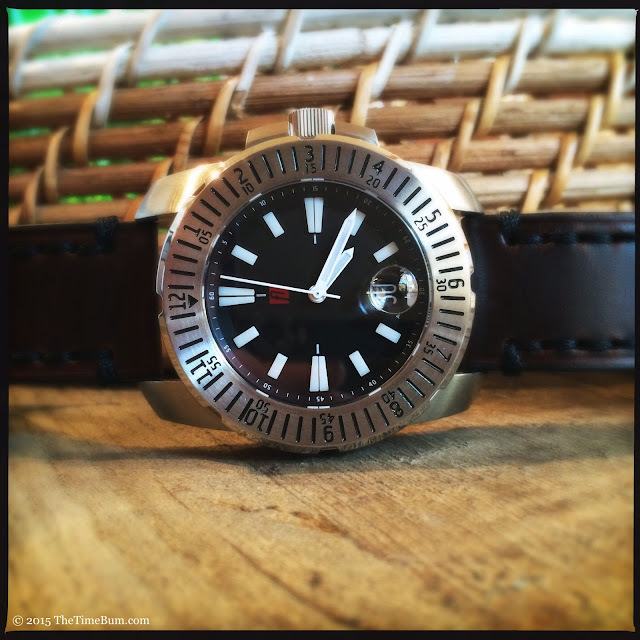 It is comfortable enough and a necessity on a dive watch, but I am more of a leather guy myself. 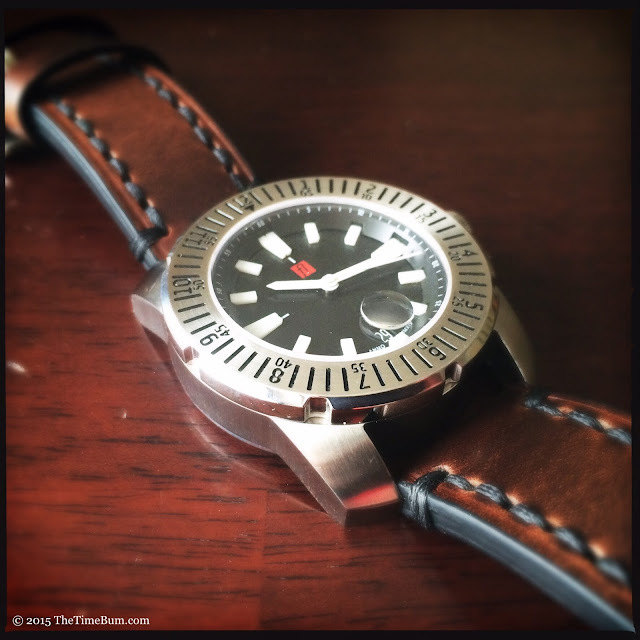 Fortunately, it is also supplied with a black buffalo textured leather strap with an engraved Pre-V style buckle. 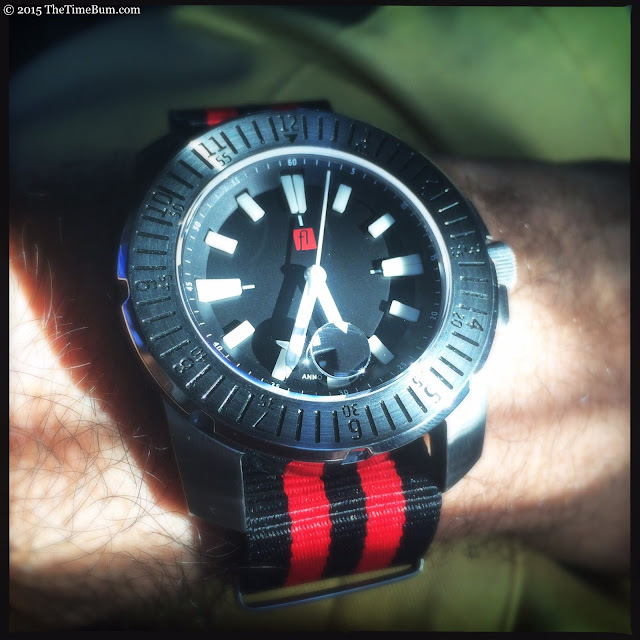 Finally, a red and black striped nylon NATO gives you a lightweight, waterproof option. The colors play well off the dial, but I think a watch this large needs a heavy strap for balance. You would think that three straps would be enough for anyone, but not for The Time Bum. I could not resist trying a couple more from my own collection. The lugs offer plenty of clearance between the case and spring bars, so they swallowed everything I could throw at them. I settled on a dark brown Panatime Vintage Tobacco with black stitching that warmed it up nicely. Thick straps are definitely the way to go with this watch, after all, it's not like you will be wearing this to the office. Go big or go home. 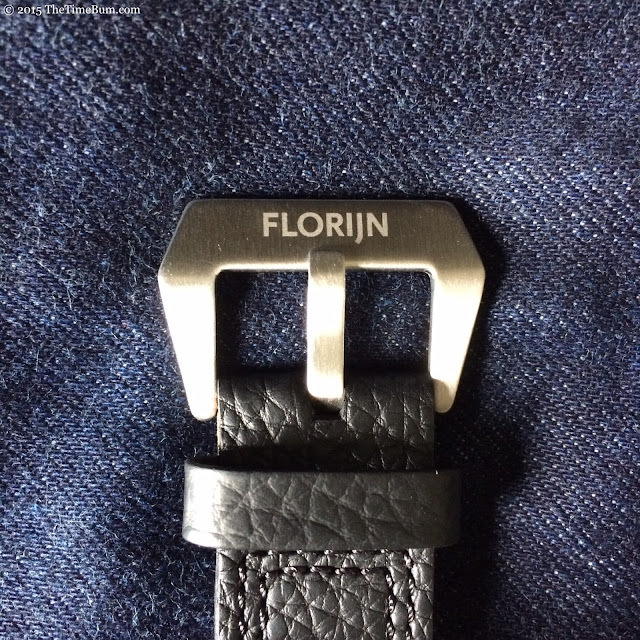 The Florijn is available directly from their web store for € 395 (about $431 USD), including VAT, which means we lucky Yanks can get one for only € 326, or $355 USD. This is a lot of watch for the money. As I said in the beginning, the Florijn is not subtle. It is a massive chunk of metal that stands proud on your wrist and says, "Yeah buddy, I'm a watch. Wanna make something of it?" And you know what? I'm fine with that. I like its burly body, bold bezel, and bizarre bubble. 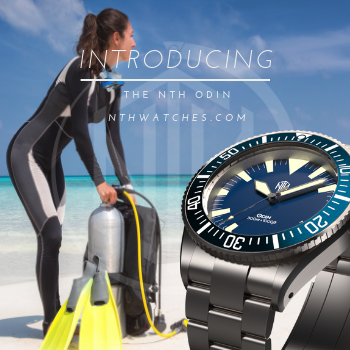 It looks like no other dive watch and pulls it off in an endearing fashion. 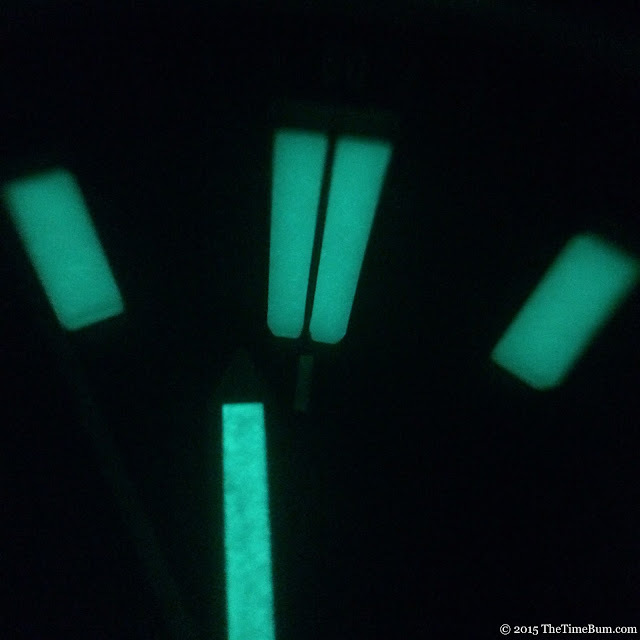 Con: Lume could be better, no bezel pip. Sum: Subtlety is overrated. The Time Bum approves.